Perspective: Does the General Conference Have Authority? In order to place the question in perspective, consider for a moment a foolish comparison: Hard by the west side of the Alamodome in San Antonio, where the meetings of the recent General Conference Session were held, runs Interstate Highway 35. A steady stream of vehicles continued to rush by at the 60 mile per-hour speed limit as posted on that highway. If the session voted to change that speed limit to 45 miles per hour, it would have no effect on the traffic, given that such an action is not within the jurisdiction of the General Conference. That decision resides with the City of San Antonio and the State of Texas. This may seem to be a ridiculous comparison, but for all its seemingly foolishness, it gets at the heart of the issue by asking what really is within the jurisdiction of the General Conference. In an attempt to give authority to the application of actions voted by the General Conference, a statement Ellen White made in a private letter in 1875 is frequently quoted, in which she observed, “When the judgment of the General Conference, which is the highest authority that God has upon earth, is exercised, private judgment must not be maintained, but surrendered” (Testimonies for the Church, Volume 3, p. 492). While this concept has merit, other observations she makes are rarely placed in context with it. In a letter written in 1896, some twenty years later, she stated, “The voice from Battle Creek, which has been regarded as authority in counseling how the work should be done, is no longer the voice of God” (Letter 4, 1896; Manuscript Releases, Volume 17, pp. 185, 186). Two years later she wrote, “It has been some years since I have considered the General Conference as the voice of God” (Letter 77, 1898; Manuscript Releases, Volume 17, p. 216). As the 1901 General Conference session drew near, she said, “The voice of the conference ought to be the voice of God, but it is not” (Manuscript 37, 1901; Sermons and Talks, p. 159-160). And even after the 1901 reorganization of the General Conference and the establishment of union conferences, her concern continued to the 1903 session as well. Her resistance to centralization was expressed in her opposition to what she called, “kingly authority,” which she rejected. “It has been a necessity to organize union conferences, that the General Conference shall not exercise dictation over all the separate conferences. The power vested in the Conference is not to be centered in one man, or two men, or six men; there is to be a council of men over the separate divisions. In the work of God no kingly authority is to be exercised by any human being, or by two or three. The representatives of the Conference, as it has been carried with authority for the last twenty years, shall be no longer justified in saying, ‘The temple of the Lord, the temple of the Lord are we.’ The men in positions of trust have not been carrying the work wisely” (Manuscript 26, 1903). Does this mean the General Conference has no authority? Certainly not. But the statement regarding it being the highest authority on earth, used as it often is to impose control over the church, is at best disingenuous, and perhaps, misleading. Even if at times it may be true, this on again, off again coverage is clearly spotty over time, and the question arises as to when and how we determine it to be such an authority. Being an authority does not convey inerrancy. That the General Conference in session can and does err in its judgement and actions is demonstrated by the issues of the 1888 session, which are still debated today over a century later. In addition, some actions taken in subsequent years since that time are certainly not above question. To assume everything voted by the session is the will of God is a mammoth leap of reason, to say nothing of theology. Perhaps, rather than a ringing endorsement of its authority, the comment should be taken as an apology, stating that this institution, with all its human foibles, is the best that we have to work with at any given time. Assuming that every action taken at the session is the will of God for the world church, what does such a stance say about those who voted against the action? Were those who in good conscience voted in opposition to a given action, thus voting against the will of God? Clearly, many things voted at the session would not fall into the category of the will of God. Such matters as voting to close discussion, or times of meetings, or adjournment would not generally be considered will of God issues. All this being the obvious case, it then needs to be determined just which things are in the jurisdiction of the General Conference and which are not. Though the list is much longer than given here, yet a few examples will serve to illustrate the point, as delineated in GC Working Policy B 05, point 6. Different elements of organizational authority and responsibility are distributed among the various levels of denominational organization. For example, the decision as to who may/may not be a member of a local Seventh-day Adventist Church is entrusted to the members of the local church concerned; decision as to employment of local church pastors is entrusted to the local conference/mission; decisions regarding the ordination of ministers are entrusted to the union conference/mission; and the definition of denominational beliefs is entrusted to the General Conference in session. Thus each level of organization exercises a realm of final authority and responsibility that may have implications for other levels of organization. Authority belongs to each of the four distinct levels of church structure which, as the policy states, is “a realm of final authority.” Thus the General Conference may not act upon issues relating to individual membership. Though in the Roman Catholic system, the Pope may excommunicate individual members, in the Seventh-day Adventist Church, neither the General Conference in session nor any level of church governance, other than the local congregation, may do so. Membership, as well as church officer election, belongs exclusively to the local congregation. And though the congregation as a constituency does not operate under a constitution and by-laws as the other constituent levels do, the Church Manual serves as its template for action. Likewise, the staffing of pastoral positions, as well as conference level employees, is within the authority of the local conference and may not be countered by other levels of the denominational organization. Further, the structure of the church established in the 1901 and 1903 General Conference sessions, as clearly stated in policy B 05.6, places the authority for the ordination of ministers at the union conference level of church structure. While it is true that the general level does establish the criteria for both membership and ordination, it does not have authority as to who may be accepted as members or who may be employed or ordained, so long as they meet the criteria established. Illustrative of the issues that arise when cross constituency meddling occurs, is the vote of the General Conference several decades ago “authorizing” the ordination of women as local church elders. While it may have been a good idea to encourage churches to do so, there was no cause to “authorize” the practice, since such authority for selecting elders rests with the local congregation and there was no prohibition for selecting women to such a post. How incongruous would it have been to vote to “authorize” the election of women as church clerks, or church treasurers, or Sabbath School superintendents when, likewise, no such prohibition existed for staffing these offices? All this forces the question, why is it acceptable for the divisions to go their separate ways regarding the ordination of women as local elders, but it is not acceptable for them to do so regarding the ordination of ministers? To say that the one splits the church and the other does not, makes no sense. An additional argument advanced is that ordination to ministry is for the world church. But so is membership and ordination as an elder. Any person who has been accepted into membership is free to join any church worldwide by transfer, and anyone who has been ordained as an elder is eligible to hold such position in any church. This argument also makes no sense. The development of a statement of fundamental beliefs for the Seventh-day Adventist Church, though seemingly necessary, is fraught with difficulties, so much so that the founders of the church resisted the idea with strong statements of the perceived risks inherent in creedalism. The preamble to the Fundamental Beliefs seeks to allay these fears and risks, by saying “Seventh-day Adventists accept the Bible as their only creed and hold certain fundamental beliefs to be the teaching of the Holy Scriptures. These beliefs, as set forth here, constitute the church’s understanding and expression of the teaching of Scripture. Revision of these statements may be expected at a General Conference session when the church is led by the Holy Spirit to a fuller understanding of Bible truth or finds better language in which to express the teachings of God’s Holy Word.”Yet even beyond these caveats is the underlying problem of language itself. Though we are fond of the notion that words have exact meaning and are capable of conveying precise clarity on a given topic or idea, the reality is that people do not share exactly the same meaning of the words they employ in expressing themselves. Differences in culture, education and personal perceptual skills gives credence to the idea that words do not have meaning. Rather people have meaning which they impose on the words they use and hear. To complicate matters further, the world church is made up of people from multiple nations and languages. Thus any statement of beliefs must be both presented and understood in multiple settings where people not only think different things, they also think the same things differently. Turning Fundamental Beliefs into a creed violates this principle of perception. In addition to the language and perception problem is the authoritarian drift that such statements inherently possess. Vested in the General Conference level, as the policy indicates, is “the definition of denominational beliefs.” Yet even here we need to ask, are the 28 Fundamental Beliefs tests of membership, tests of fellowship, tests of leadership, or tests of employment? Must one accept all 28 statements (or whatever number there are of them at a given point) in their entirety to join the church? Or can a person be dis-fellowshipped for failure to accept them all? Is it a requirement that all 28 be agreed to in order to hold office in the church? Or what about employment? Are these a requirement for ministers and teachers, but not necessarily for janitors or cafeteria employees? And can the church employ someone as an attorney, or financial advisor, or a musician, who does not accept all 28? Or for that matter, who may not even be a member? Furthermore, given that membership issues belong to the local church, who will enforce these matters, and how will it be done in a consistent manner? The 28 beliefs as currently expressed would not have been believed or accepted by many of the early leaders of the church. A prime example of this is the doctrine of the Trinity. Many early Adventists held Arian beliefs regarding the life and ministry of Jesus. And this notion persisted well into the middle of the 1900’s, as demonstrated in the hymnal of the church printed and used during that era. The well-known hymn, “Holy, Holy, Holy,” which in its original Protestant form contained the verse, “God in three persons, blessed Trinity” was changed to fit the Arian perspective and was sung as, “God over all, who rules eternity.” In the current hymnal, it is returned to its original wording, reflecting the Trinitarian view. Does this mean that those of the Arian notion were not real Adventists? Were they unworthy of membership, or fellowship, or leadership, or employment? And if we overlook that divergence in the past, do we ignore it today? Further to the point is the divide over the role of Ellen White in the church and the prophetic office. In the early days there were many who did not accept what is generally proffered today as her authority in the church. Not only was she not accepted in parts of Europe early on, but her time in Australia was devised by church leadership, not so much as a mission venture, but as a method of getting her out of North America and away from the General Conference leadership. As the preamble maintains, the statement of beliefs is changed from time to time, as better understanding and language is used to more clearly convey the church’s shared perception of biblical truth. But by this very concept, the statements are demonstrated to be only an expression of beliefs at a given moment in time, of perceived truth found in Scripture. If the Bible is the only creed, as the preamble states, then we should not be writing into the Fundamental Beliefs wording and expressions that are not in the Bible. In this context, much has been made of the effort to insert into the fundamental beliefs, wording regarding creation that is not in scripture itself. And speculation abounds as to how insistence on this wording will play out in such matters as membership and employment. As clearly demonstrated at the San Antonio General Conference Session, the process being followed to do the business of the church has become nearly non-functional. It does not take much rational thought process to realize that attempting to carry on an open floor discussion with over 2,500 people is not a viable way to do business. The system needs to be changed to reflect reality. A few examples will suffice to illustrate the point. Given that all changes in the Church Manual require a vote from the session, an editing process was undertaken in which it was discussed at length whether the preposition “in” or “on” should be used in the document under consideration. Multiple speakers with varying linguistic backgrounds and native languages weighed in at length on the issue. Not only was the folly of such a discussion on the floor obvious, but the fact that the document would be translated into multiple languages made it even more absurd to spend the time of the world church on such matters. Another similar editorial change that had to be voted by the session was the change of name for one of the divisions which was employed to more accurately reflect the territory and people it was serving. But rather than merely making such an obvious editorial adjustment in the text, it had to come to the floor for a vote, where it engendered useless discussion. Perhaps the most abused process of a session seeking to have open floor discussion among thousands of delegates is the “Point of Order” request. In the San Antonio meeting this abuse was rampant. Whether it was based on ignorance of the rules of order in a democratic process, or an intentional attempt to subvert the process is difficult to assess. However, when speakers at the microphone calling for points of order nearly equal the number of those speaking to the issue before the body, it is clear that the process is broken. Given that the chair ruled most of such requests as failing to meet the requirements of a point of order, it is evident that a better system needs to be devised. Rather than employing the services of one parliamentarian to advise the chair on process, it would be helpful to provide deputy or assistant parliamentarians on the floor to screen such point of order requests before spurious interruptions to the process consume the time of the business at hand. The work of the Nominating Committee is, in particular, an unrealistic process. The members of this body are constituted by a caucus of the divisions/attached unions soon after the opening of the session. Upon being selected and voted by the session as its Nominating Committee, these individuals, who had no advance knowledge that they would be on the committee, then proceed to elect a chair and secretary from their midst, who likewise have no knowledge or time for preparation for such a responsibility in advance. 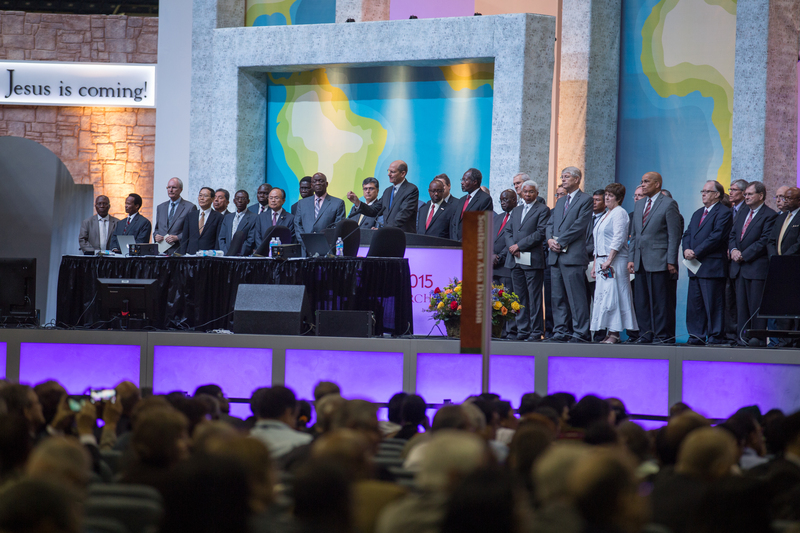 This large group of over 100 members, constituted of people from all over the world church, must embark on selecting for nomination, hundreds of individuals to serve not only in General Conference leadership positions, but in the thirteen division territories as well. Few on this committee have a knowledge of either the territories represented by the world church, or their needs and personnel for leadership. After getting organized, the work of nomination begins, usually by the first Friday morning of the session. The first order of business is the nomination of the General Conference President, which is expected to be delivered to the floor of the session before noon. When presented, its acceptance is generally assumed and the vote called for quickly. This expected short time frame of a few hours on Friday morning of the session is in stark contrast to other nomination and leadership processes and requirements of the church. The nomination of local church officers and leaders generally occurs over a period of time of a month or two of careful study, and once presented to the church body, the nominations require a first and second reading, separated generally by one week or more. The selection of a new pastor often extends into several months, or even a year of search. Leadership in such positions as principals and presidents of educational institutions generally follow a long and careful search process. In this context, it seems astonishing that we would expect the election of world church leadership to be pressed into a few hours on the first Friday of the General Conference Session. To further complicate the dilemma of the Nominating Committee, it is tasked not only with providing for the election of General Conference leadership, but division leadership as well, given that divisions are not constituent entities and do not have such authority on their own. Thus members of the committee are expected to staff divisions which the bulk of the committee members know little or nothing about. So the divisions go into caucus and present a list of prospective officers and leaders to the Nominating Committee who basically “rubber stamp” the selections and pass them on to the floor of the session for their “rubber stamp” as well, given that they know even less about the individuals nominated than the members of the committee do. And one has to wonder why this matter is not just left with the divisions to decide on their own at a time and in a setting where much more informed and careful decisions can be made. 1. While the Commission does not have a consensus as to whether or not the scriptures and the writing of Ellen G White explicitly advocate or deny the ordination of women to pastoral ministry, it concludes unanimously that these sources affirm a significant, wide ranging, and continuing ministry for women which is being expressed and will be evidenced in the varied and expanding gifts according to the infilling of the Holy Spirit. The action presented in all three of these sessions was to approve the ordination of women. The action failed on all three occasions. When a motion fails, it simply goes away. It does not create the opposite of the intent of the motion. Therefore, the result neither establishes nor forbids the practice of ordaining women in these sessions. Three factors are significant in this issue. First, the ordination issue does not belong to either the division or the General Conference level. It is assigned by policy to the union conferences. As such, this was not an item that should be on the General Conference agenda without changing the basic structure of the Church. Second, there is not, nor has there been a policy against ordaining women to ministry. Since no such policy exists, there is no valid reason to vote on giving permission. We do not need to authorize that which is not forbidden. Finally, the failure of the vote to authorize such ordination on these three occasions, results in the action simply going away. And it is neither authorized nor forbidden. A motion that fails, results in no action. It is accurate to say that both precedent and perception regarding such ordination lead to the opinion that it is not allowed. However, neither precedent not perception are policy. Given that these actions do not forbid the ordination of women to ministry, then as stated, the position of the church remains as it was before these actions. The question then is, what is that position? Ordination authority is clearly defined in General Conference policy. Regarding the approval of persons designated for ordination GC Working Policy B 05 states, “decisions regarding the ordination of ministers are entrusted to the union conference…” Regarding such decisions the policy further states, “each level of organization exercises a realm of final authority and responsibility…” Thus, in the selection and authorization of such individuals, the General Conference has no authority over the union conference decisions, so long as these decisions are in harmony with the criteria established for ordination by General Conference policy. The General Conference Working Policy does establish the criteria for ordination. There are fifteen such criteria listed in GC Working Policy L 50, none of which refer in any way to gender. If, therefore, any individual approved by a union conference meets these fifteen criteria, the General Conference authority has been satisfied. Given that there is no gender reference in these requirements, the union conference is acting within its authority to ordain women as stated in GC Working Policy B 05. Policy exercises governance over both practice and perception. But in the case of gender issues in ordination, there is no policy. However, over a century of practice has created the perception that there is policy on this matter, and one hundred years of practice certainly does establish precedent. But it remains that policy is the issue in ordination, neither practice, precedent nor perception. The actions of the three GC Sessions are not based on policy, leaving one to wonder what they were based on; practice, precedent, perception, or perhaps prejudice? But unless the General Conference changes its policy and takes away the authorization given in GC Working Policy B 05 to other levels of governance such as the local church regarding membership, or the local conference regarding employment, or the union conference regarding ordination, it is not free to intrude into these areas. Thus its attempt to counter the union authority in the area of ordination is a violation of its own policy. The perception exists that the General Conference cannot violate policy, that whatever it does constitutes policy, but this is not so. The General Conference can violate policy just as well as any other level of the church, if and when it acts contrary to the provisions of policy. Unless and until the General Conference changes the policy by specific vote, any action contrary to that policy is a violation. Thus, the union conferences are not out of policy on this matter of gender inclusiveness in the ordination of ministers. The General Conference itself is out of policy by intruding where it does not have authority. 1. Divisions should be made constituent levels of organization, and much of the business of the GC Session should be transferred to these levels. As the church nears the twenty million membership level, and as most divisions number over one million members, the leadership and authority for their work should be shifted to their own territory for better efficiency and understanding of needs. 2. Better methods of seeking input on issues should be found, rather than attempting to conduct open floor discussion with over two thousand people. The democratic process can still be accomplished by providing opportunity to vote on issues without open discussion in a time crunched environment. 3. Uniformity of action imposed on all divisions must not be confused with unity of purpose for the church as a whole. Diversity of behavior already exists in the church in such matters as life style, dress, Sabbath activity, polygamy, family relationships and a host of cultural, religious and traditional behaviors. Imposing the traditions and tastes of one area of the church on another, is not a method of securing unity. Rather it is a recipe for disunity, clearly demonstrated by the cheering, booing and hissing which accompanied perceived victories over votes taken at the recent session. 4. The process of hermeneutical interpretation and understanding of scripture is in jeopardy when narrow fundamentalist readings of scripture trump the council of the leading biblical scholars of the church and its seminaries. Picking and choosing parts of scripture to make a point while ignoring other parts – at times even in the same verse – is at best dangerous, and perhaps even dishonest. Such faulty biblical interpretation must stop. 5. Authority in the various constituent levels of the church must be clearly defined and adhered to. No part of the church is without its constituted authority and it must be seen as operating in “a realm of final authority” in its assigned responsibilities as policy states, lest we reverse the structure of the church developed in 1901 under the leadership of Ellen White and return to the “kingly powers” error so strongly opposed at that session. 6. The tendency toward ever expanding and explicit fundamental belief statements, with the potential of leading to creedalism, should be halted or reversed. Jesus summed it up with two simple but profound statements, “Love the Lord your God with all your heart, and your neighbor as yourself.” The early Christian church summarized requirements in four restrictions, “abstain from food sacrificed to idols, from blood, from the meat of strangled animals and from sexual immorality.” We can do better than to continue to build an ever expanding and more tightly defining list of beliefs. 7. Address issues of broad scope for the mission of the church at these sessions, and avoid the minutia of such things as editing and wording of documents. Let such materials that must be processed by the session, be prepared with broad opportunity for input over adequate time frames, and vote them up or down without floor discussion. 8. Do not allow the session to be encumbered by those who, out of ignorance of process or intent to disrupt, or desire to be seen and heard, frustrate the purpose of the agenda and proper procedure. 9. Make it clear that practice, precedent, and perception are not policy. No matter how long an idea may have persisted, it is actual policy that governs the church at all levels. If we do not like the policy, change it. But do not violate it by usurping that which belongs to another constituency. 10. Construct the session program so that its purpose is to cast a large vision for the future of the church, rather than spending time addressing minutia that can be better handled by other levels of the church structure. Dr. Gary Patterson is a retired field secretary of the General Conference of Seventh-day Adventists. He served as senior pastor of some of the largest congregations in the denomination, a conference president in two conferences and assistant to the president of the North American Division. This article first appeared in Adventist Today, and will be included in the forthcoming print edition of the Adventist Today magazine. It is re-printed here with permission.